St. John's Prep celebrating its upset victory over BC High. DANVERS, Mass. - Over the three years of St. John’s Prep coach Brian St. Pierre’s tenure as head coach, his Eagles have rarely been home underdogs. On Saturday afternoon, however, and with fourth ranked BC High paying a trip to Danvers, St. Pierre knew his team would largely be disregarded. The veteran play caller used it as motivation to energize his young club, and no one responded more than first year quarterback Mike Yarin, who amassed four total touchdowns to propel his team to a 35-17 win over BC High (4-1). St. Pierre said Yarin’s progression from week-to-week has been staggering. 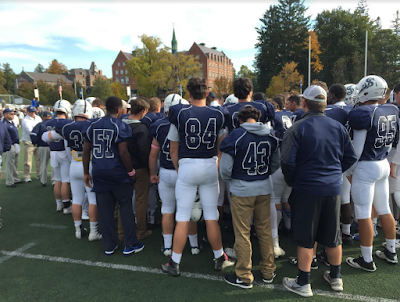 St. John's Prep (4-2) kept the pressure on their conference rivals all afternoon long. Each time BC High put points on the board, The Prep responded with a scoring drive of its own. That was never more apparent than with the first half coming to a close. Following a 50-yard touchdown from star running back Danny Abraham and a 32 yard field goal courtesy of Jarod Mockus, BC High seemed to be on the verge of heading into the half with a 10-7 advantage and all the momentum. Yarin and company had different ideas. Kick return specialist Aise Preim brought out the ensuing kickoff to the BC High 36 yard line, and eight plays later Yarin (13/19, 170 yards, 2 TDs, 14 carries, 71 yards 2 TDs) took a direct snap and ran straight up the gut for a two yard score to give St. John’s Prep a 14-10 advantage. St. John’s Prep's scoring output for the half did not stop there. On third down and five from their own 45 yard line, BC High quarterback Conor Cady was intercepted by Hayden Rockett, who jumped a crossing route to perfection and returned it to the BC High 17 with 16 seconds remaining in the half. After a sack by Francis Dooley, St. John’s Prep looked like they were going to let the end of half opportunity go to waste, but Yarin stepped up, hitting Rockett on a simple vertical route out of the slot position for a 27-yard score to give St. John’s Prep at 21-10 lead at the half. Just one year ago, St. John’s Prep grabbed a 21-0 lead on BC High heading into the fourth quarter only to see their defense surrender 21 unanswered points in the span of seven minutes to send the game to overtime. St. Pierre said it was imperative that his team score on the first drive of the second half to quell any hopes BC High had of a comeback. Behind the stewardship of Yarin, St. John’s Prep embarked on an 11-play, eight and a half minute drive to begin the third quarter that culminated in a 12-yard touchdown run from Yarin. The pivotal moment of the game, however, came earlier in the drive when on fourth and nine from the BC High 25 yard line, Yarin hit receiver Michael Galatis on a 12 yard comeback route for a first down and an additional opportunity to drain clock. BC High refused to go down quietly. On the final play of the third quarter, Cady hit Bobby DeMeo for an 86-yard touchdown pass on a post route to get BC High back within 28-17 as the game turned to the final frame. It was one of the rare bright spots for the BC High passing attack, which struggled to find a rhythm all afternoon long. Even when the Eagles’ athletic combination on the outside of DeMeo and Kyle Burke got a bit of daylight inside the St. John’s Prep secondary, Cady had a difficult time hitting his receivers. In total, Cady finished just 6-for-19 for 155 yards, an interception, and one touchdown. Despite Cady and BC High’s last ditch effort to pull off a late game-saving miracle, The Prep offense proved to far too potent as, with five minutes to go, Yarin connected with Galatis for his fourth and final touchdown of the game. This one came from 35 yards out, and put St. John’s Prep back up 35-17.